On Tuesday, June 6th, President Monaco hosted the second of three President’s Picnic at the Boston Campus. 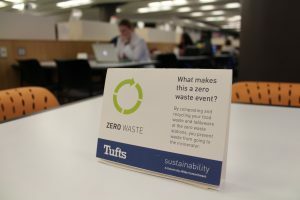 These annual zero-waste events bring together the Tufts community to celebrate another year of hard work. The zero waste initiative at each of these picnics encourages attendees to BYOP — Bring Your Own Place-setting — which reduces waste created from disposable dishes, cutlery, and cups. 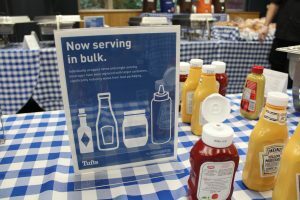 Condiments and drinks were served in bulk, rather than individual packets, to further reduce packaging waste. 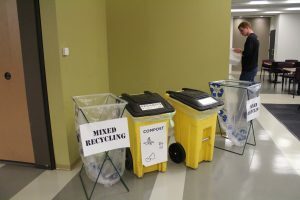 Recycling interns helped sort recycling and compost at special Zero Waste Stations. 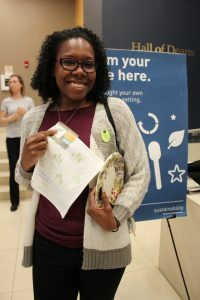 Attendees who brought their own dishes could also win special, sustainable prizes! This year, the first fifty won a reusable paper towel. Attendees did a fantastic job helping us keep this event zero-waste. We hope everyone enjoyed the great food and company and will continue these sustainable practices into the future! Click for recaps from the Medford President’s Picnic and the Grafton Presidents Picnic.